Modern Warfare 2's story put a frowny face on the writer of Crysis 2. To Richard Morgan, the sci-fi author hired to pen Crysis 2, Modern Warfare 2 is not the game it should have been. 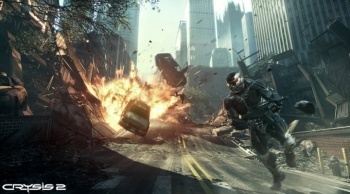 At a recent Crysis 2 event held in New York (covered by The Escapist here), Morgan told CVG that the story of Modern Warfare 2 just doesn't cut the mustard. "I thought Modern Warfare 2 was an immense disappointment," he said. Doesn't he know that Modern Warfare 2 is the most popular game of all time, and therefore has no flaws? Ah, sarcasm. He went on to say that Modern Warfare 2 is a "massive step down from Call of Duty 4: Modern Warfare" and that the "story is worse and the game doesn't really hang together, it's just a bunch of mission levels." "It made no sense. It was totally implausible. It doesn't resolve. Basically, all the things that bad storytelling does. I just think they were way too impressed with themselves and that's always a danger. It's just unfortunate." The world doesn't seem to have the same opinion as Morgan, or care as much, considering how people have already played Modern Warfare 2 for 200,000 years on Xbox Live alone up to this point. It's always nice to see a dissenting opinion of a game that is so popular, but it's a little harder to accept from someone working on a competing product. However, Morgan's impartiality could be shown in later comments made about Uncharted 2. "Everything that didn't work very well, they fixed or ramped up or did something with," he said of Naughty Dog's recent effort. Is this just one man's opinion, or did Modern Warfare 2 really disappoint as far as the single-player game goes?